Unlike wood, which is porous, brick is ill-suited for paint adhesion and must be conditioned to accept a new finish. If you wish to refinish your interior brick floors, you will need to pay special attention to surface preparation, or the new finish will peel and flake shortly after application. In addition, you must choose the proper type of coating, capable of withstanding a considerable amount of stress, or you will end up with chipping. Don't paint over an unprimed interior brick floor--the paint will peel. Remove sealer from the brick floor by sanding it with 120 grit sandpaper. Load the sandpaper into a palm sander to ease the process. Sand until the brick appears dull. Skip this step if the floor is unsealed. 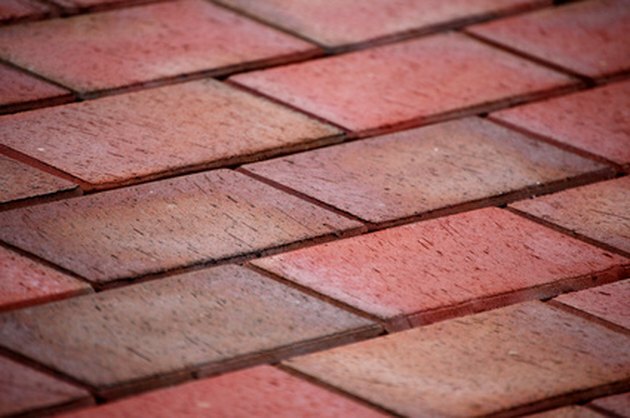 Clean the interior brick floor with a water-based cleanser, using a mop and bucket. Rinse the floor, and wait for it to dry. Protect areas adjacent to the floor with a low-tack painter's tape. Roll an acrylic primer onto the clean brick floor, using a roller affixed to a rolling pole. Wait three hours for the primer to dry. Wash your painting tools with water. Roll a two-part epoxy or acrylic floor paint onto the primed brick floor, using the cleaned roller. Wait six hours before walking on the floor.